The story of the two Kellogg brothers is a fascinating part of American history. One became America's most beloved physician between the mid-nineteenth century and World War I, a best-selling author, lecturer, and health magazine publisher, and founded the world-famous Battle Creek Sanitarium. The other founded the Kellogg Company and became one of the world's richest men. 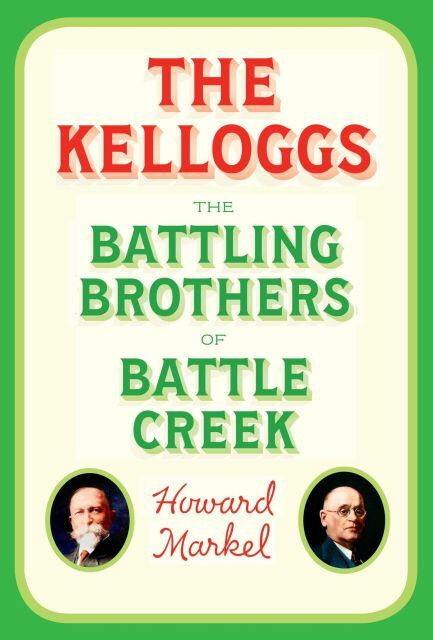 In The Kelloggs, Howard Markel tells the saga of these two extraordinary men whose lifelong competition with each other changed notions of health and nutrition and helped alter the course of American medicine. Dr. John Harvey Kellogg, internationally known and revered, was the foremost advocate of the pursuit of wellness for almost seventy years. At his famous medical center, which was also a spa and grand hotel, his patients included Mary Todd Lincoln, Booker T. Washington, Thomas Edison, Henry Ford, Amelia Earhart, Johnny Weissmuller, George Bernard Shaw, and U.S. presidents from William Howard Taft to Franklin Delano Roosevelt. His brother, Will, who with John experimented on malt, wheat, and corn meal to make a product he called corn flakes, saw the cereal as a potential gold mine, especially after John's former patient, C.W. Post, stole the Kellogg recipes and started his own food company. His Post Toasties, Grape Nuts, and Postum were devoured by millions, and the Postum Cereal Company eventually became General Foods. Will Kellogg founded his own rival firm, the Battle Creek Toasted Corn Flake Company, which became the immensely successful Kellogg Company. Among the many Kellogg products that became household staples are Corn Flakes, Special K, Raisin Bran, Frosted Flakes, Rice Krispies, Froot Loops, Eggo Waffles, Pop-Tarts, Keebler Cookies, and Pringles Potato Chips. Success brought enmity between the brothers, and Markel describes their varied fortunes in an unforgettable tale of American drive and industriousness.